Unable to integrate with Aweber. Can't login. 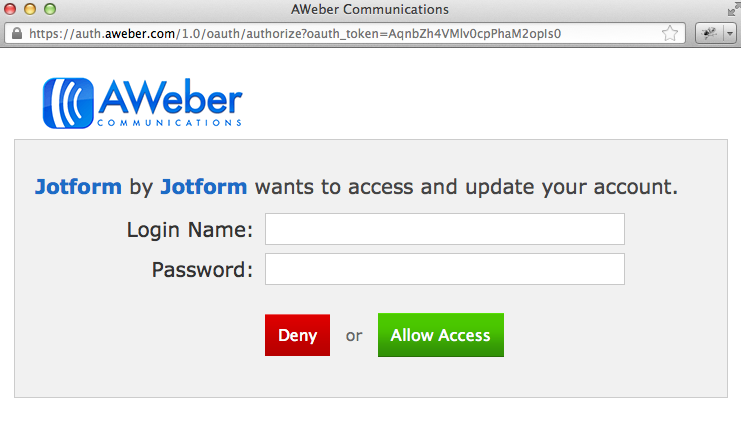 Entered Aweber username and password. After clicking Next, will not log me into my Aweber account. I'm using the correct username and password because I'm able to login to Aweber directly without any problems. Please help. Trying to integrate a form with Aweber and it's not working. Please try removing the integration and readding it. You may need to generate a new api key which is done within Aweber as it is possible that the one you got is corrupted. Also sometimes when you copy the information I would recommend making sure there are no spaces at the front or back of your entries since that can sometimes happen as well. Thanks for your help. Well, when I log into Aweber directly, it appears there is no integration already setup so there is no API key that is corrupted. This was my first attempt at trying to integrate a form with Aweber. Also, I'm not copying and pasting my Aweber username and password. I'm typing it in. Hmmm, what do you suggest now? Hello, I apologize as that response was in error. 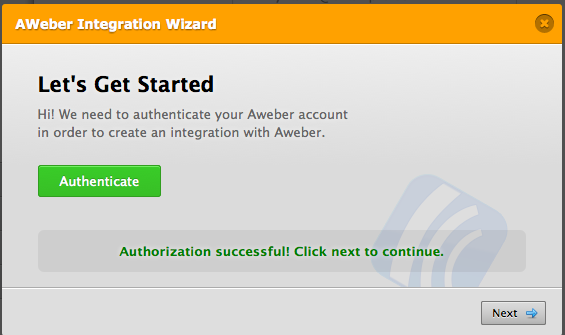 I had clicked on the wrong integration by accident previously when I thought I had clicked on the Aweber one. Unfortunately I have no way of testing Aweber since I do not have a way of testing it unless I obtain a paid account with thier services. Are you able to log into your account or does it just kick you off and the integration time out? Is there an error message or something that is displayed? Another suggestion I would like for you to try would be to log out, clear your browser cache, and login to retry the integration. I hope this helps but please let us know if you're still having trouble. Thanks again for your help. Ok, I cleared my cache. I'm still having an issue. When I enter my Aweber username and password and then click the Next button, nothing happens. No error message--nothing. It acts like it wants to do something but nothing happens. I can only get as far as entering my Aweber username and password and clicking the Next button. That's it.I'm stumped. The only thing I can think of now is to delete the form, re-create it and try the integration again. I'll let you know what happens after that. I've come to the conclusion that the Aweber integration does not work. I deleted and re-created the form and still unable to integrate with Aweber. There must be some kind of bug or something. Thanks for reporting. I don't have an Aweber account but I think there's indeed a problem with the integration at the moment. I can tell because even when you entered invalid account the validation doesn't seem to work. I will now forward this to our development team for further investigation. They'll reply to this thread once this gets fixed. Apologies for the inconveniences caused. Thanks! I'm having the same issue you're having when trying to integrate a form with my Zoho account. The error message I get is "INVALID_PASSWORD". 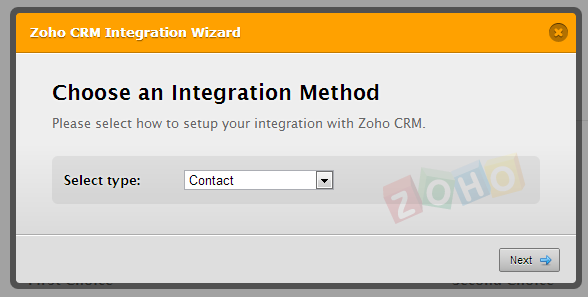 Zoho CRM is working fine,no error with integration. Please make sure to enter your account correctly, username is your email address. Once the issue is fixed, you can change your password afterwards. Thanks for your cooperation with this. I'm not giving out my Aweber username and password...especially on this forum for lots of people to see. My data is strictly private and confidential. JotForm Support needs to have a test profile for each email solution you integrate with. Do you have another suggestion as I'm not giving out my username and password? Sorry about that. We don't need your account information. One of our developers is looking into this issue and we will get back to you about this within this week. Thanks so much! I await your resolution. Hi anngiej, we implemented new authenticate login. It is safer. Woohoo! Thanks! I'll try it and let you know what happens. I'm having the same issue as @guest_22837585799072. I have been able to login directly to Zoho to confirm that I'm using the correct credentials, and even tried changing my password in Zoho to no avail. All I get is the "INVALID PASSWORD" error. The original poster's problem is about Aweber, and is already solved. Can you please open a new thread for your issue? I think I have the solution to your Zoho integration issue. I had the same problem but resolved it by changing my Zoho password to include only letters. Once I took out characters such as +_)(*&^%$#@!. the integration worked for me. Give it a try.